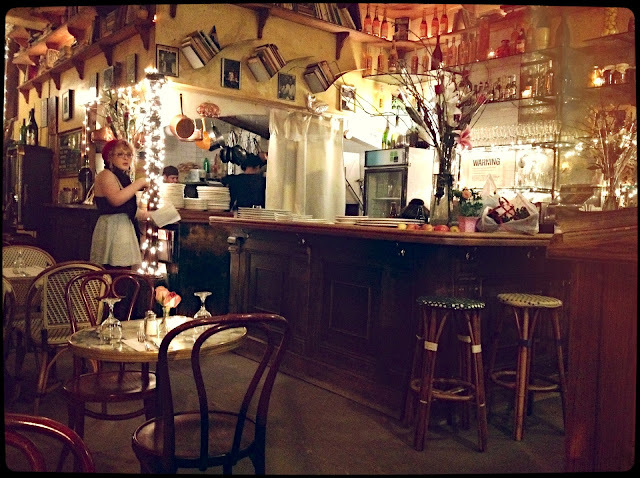 Last night, I went to this absolutely gorgeous little restaurant in the lower east side. I'd heard of it many times, but never actually been to it. It looked like it was right out of a story book. I snapped this quick picture with my phone to send to my friend and it actually turned out pretty good. The restaurant continues back into a bigger room, decorated with these gorgeous little lights. I love the small chairs and tables, it reminds me exactly of Paris. It's so cozy! I was only there for a short while for a meeting, but will definitely be back. We shared the tuna tartar, it was delicious! Wow...you made me wish I could go to NYC & Paris with just one photo.